(CNN)President Donald Trump's former lawyer Michael Cohen will testify before the House Oversight Committee, the first major move by House Democrats to haul in a member of Trump's team connected to special counsel Robert Mueller's investigation, according to a schedule published by the committee. "I thank Michael Cohen for agreeing to testify before the Oversight Committee voluntarily," said Oversight Chairman Elijah Cummings, a Democrat from Maryland, in a statement. "I want to make clear that we have no interest in inappropriately interfering with any ongoing criminal investigations, and to that end, we are in the process of consulting with Special Counsel Mueller's office." It was not immediately clear whether prosecutors in New York or for Mr. Mueller would ask Mr. Cohen to keep from discussing topics still under investigation. Nor was it clear when Mr. Cummings formally issued an invitation to testify. WaPo: Michael Cohen will testify publicly soon. Here are 5 big questions he might shed light on. "Chairman Cummings promised to pursue rigorous, responsible, fact-based oversight," Jordan said in a statement. "However, the Chairman's announcement today suggests he will be using the committee as a venue for political theater rather than legitimate oversight." Jordan knocked Cohen, saying he has pleaded guilty for misstatements he made to Congress while testifying about his contacts with Russians during the 2016 presidential campaign. "The Democrats' star witness has admitted to providing intentionally false and misleading testimony to Congress," Jordan said. "He is also a witness in ongoing law-enforcement matters, including Special Counsel [Robert] Mueller's probe." "When in the minority, Chairman Cummings and the Democrats have often cautioned against such actions," he added. "Now that Chairman Cummings is in charge, the same standards don't seem to apply. This makes clear that Chairman Cummings and the Democrats will do whatever it takes to attack this President." A key Senate panel is moving closer to issuing a subpoena for Michael Cohen, the president’s former personal attorney and fixer, as part of its ongoing investigation into Russian interference in the 2016 presidential election. Cohen was sentenced in December to three years in prison for financial crimes, two violations of campaign finance law, and lying to Congress – a charge based on false testimony he provided to the Senate and House intelligence committees in the fall of 2017. He met twice with the Republican-led Senate Intelligence Committee in September and October of 2017, but the first interview was hastily cut short by “disappointed” committee leadership after Cohen released his own statement to the press beforehand. Michael Cohen is scheduled to testify before the House Oversight Committee on Feb. 7, and, oh boy, is that going to be something. In fact, if he really gives a comprehensive account of everything he saw and did while toiling as Donald Trump’s factotum, he could be to the Trump administration what John Dean was to the Nixon administration. Cohen could peel away the layers of deception and denial to expose the rancid corruption boiling underneath. Cohen has pleaded guilty to lying to House and Senate Intelligence committees about the Trump Moscow deal, and Schiff has already said the committee would like to re-interview him when Democrats reopen the committee’s shuttered Russia probe. Cohen misled lawmakers to “minimize links between the Moscow Project and Individual 1,” an individual believed to be Trump, "in hopes of limiting the ongoing Russia investigations,” according to Special Counsel Robert Mueller. The president’s personal lawyer says he was just following orders. WASHINGTON (Reuters) - President Donald Trump's former personal attorney Michael Cohen is reconsidering his plan to testify publicly to the US Congress next month because of intimidation by the president, an adviser to Cohen said on Thursday. "There is genuine fear and it has caused Michael Cohen to consider whether he should go forward or not, and he has not made a final decision," Davis said. Last week Cohen agreed to appear before a congressional panel on Feb. 7, as US House of Representatives Democrats began kicking off numerous investigations of Trump, his business interests and his administration. A legal representative for Donald Trump’s former lawyer Michael Cohen expressed concern to congressional investigators this week about his clients’ safety and urged Republicans to rein in the president’s attacks on his former fixer. Lanny Davis, Cohen’s legal adviser and spokesman, traveled to Capitol Hill in recent days to discuss security and other logistical issues in meetings with House Oversight and Reform Committee Chairman Elijah Cummings (D-Md.) and Democratic committee aides. He said he pressed Republicans on Trump’s repeated tweets about Cohen’s family — particularly his client’s father-in-law — urging them to get their party leader to tone down his rhetoric about Cohen. Oversight Democratic and Republicans aides declined to comment for this story. But Democratic sources and one lawmaker on the panel told POLITICO that Democratic investigators were thinking about ways to push back on Trump and ensure Cohen’s safety. Davis’ meeting with Hill staff come amid reports that his client is getting cold feet about testifying before Congress on Feb. 7. 45 making thinly veiled threats about Cohen's father in law is witness tampering of some sort, ain't it? Yeah, and the thing is, Cohen's father-in-law is a Ukrainian who was allegedly one of Trump’s "business partners," back in the day. That's supposedly how Cohen got the gig as Trump's thuglawyer. 'Course, Twitler is loyal to noone. Fima Shusterman, Cohen's father-in-law, was convicted of money laundering in 1993. Shusterman is a major scuzball. Also in the Rolling Stone article (which I always go back to when I need to find out some detail or other about Cohen) is a nugget which sends me into a paroxysm of hysteria whenever I read it. Cohen’s in-laws Fima and Ania Shusterman bought three units in Trump World Tower worth a combined $7.66 million (one of which was rented to Jocelyn Wildenstein, the socialite known as “Catwoman” for undergoing extreme facial plastic surgery to please her cat-loving husband). Well, since you mentioned Michele Pfeiffer as Catwoman, Cohen is innocent. On Sunday, Schiff said that the statement from the special counsel's office about the BuzzFeed story may have to do with "wanting to be able to use Michael Cohen as a witness in further prosecutions, and wanting to make sure that the public didn't have a perception that he was saying more than he was saying at least to the special counsel." "There is a lot more to learn," Schiff said. "Congress has a fundamental interest in two things: First, in getting to the bottom of why a witness came before us and lied, and who else was knowledgeable that this was a lie." Schiff said his committee would do everything it could to make any eventual report by the special counsel public. William Barr, Mr. Trump's nominee to be the next attorney general, declined to commit to releasing the report in its entirety during confirmation hearings last week. "Because they will fight us on this, we need to do our own investigations, because at the end of the day if the Justice Department tries to stonewall the release of that report for whatever reason, the American people are going to need to know what happened, and we're going to have to press forth," Schiff said. Seems to me there must be a crime somewhere in all this that can be pinned on Trump and Giuliani. Well that ruined my day, Chili. 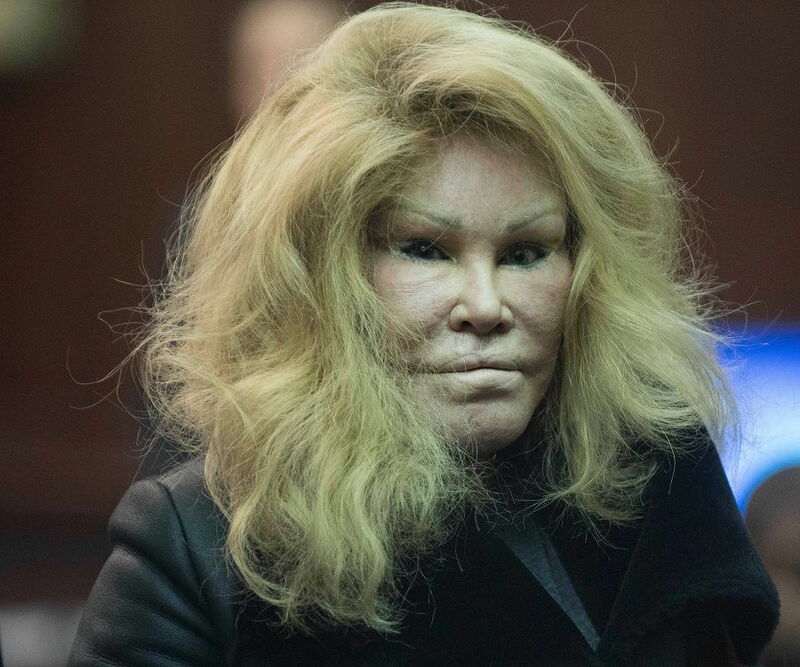 Ms. Wildenstein has filed for bankruptcy. That $2.3 billion divorce settlement was clearly inadequate. Women always get the short end of the settlement stick. “Cohen is delaying his testimony due to threats from Trump and Giuliani,” Lieu said on Twitter, referring to one of the president's attorneys, former New York City Mayor Rudy Giuliani (R). He then cited a federal statute regarding witness tampering. Cohen is delaying his testimony due to threats from Trump and Giuliani. "Whoever knowingly uses intimidation, threatens ... or attempts to do so ... with intent to ... influence, delay, or prevent the testimony of any person" is guilty of a felony. 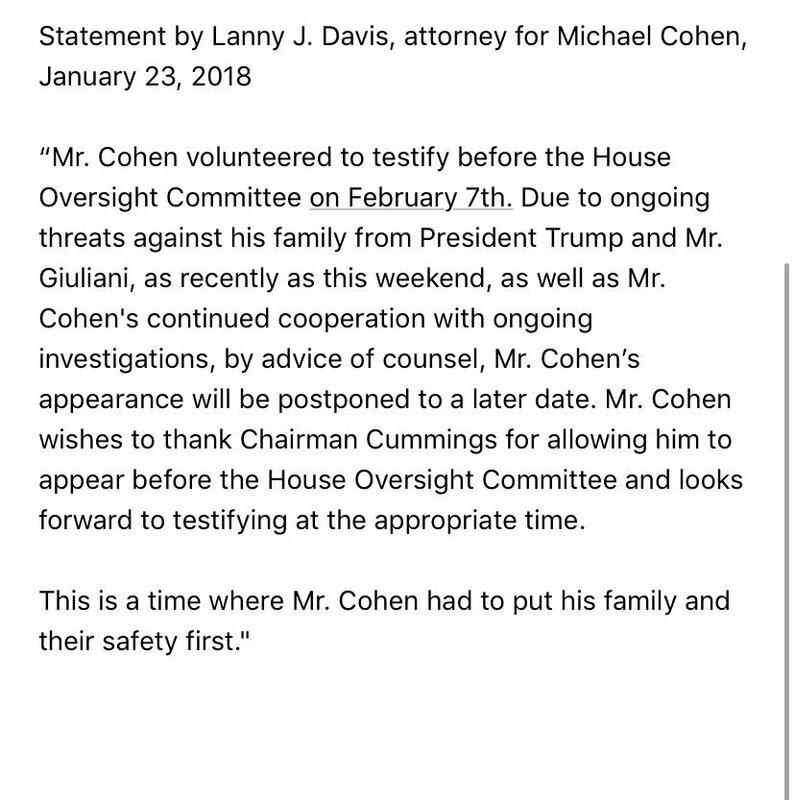 Lanny Davis: "Due to ongoing threats against his family from President Trump and Mr. Giuliani, as recently as this weekend, as well as Mr. Cohen's continued cooperation with ongoing investigations, by advice of counsel, Mr. Cohen’s appearance will be postponed to a later date." Sen. Richard Blumenthal (D-Conn.) said on Wednesday that President Trump is "clearly" violating law against intimidating witnesses with his comments about his former lawyer Michael Cohen. “I believe a sitting president can be indicted… to stop ongoing criminal activity," he added. so........when does cohen think it would ever actually be safe to testify? seems like the long con.